Software developers are among the most sought-after professionals in the world today, and the demand for their talents is only expected to grow for the foreseeable future. The Bureau of Labor Statistics predicts that jobs in the field will grow by 24 percent from 2016 to 2026, compared to 7 percent growth for all jobs. Software developers are the creative minds behind software programs, and they have the technical skills to build those programs or to oversee their creation by a team. They create software that enables users to perform specific tasks on computer devices. From the consumer's perspective, that task could involve playing a game, watching a movie, writing a business letter, or building a spreadsheet. The possibilities are as endless as the list of apps available for your mobile device. Moreover, specialized software is created or customized for virtually every profession, industry, and government department. 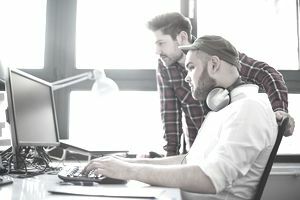 Software developers typically have a bachelor's degree in computer science and a strong set of programming skills. Students studying computer science should focus on classes related to building software. Internships are highly recommended as they provide insight into various industries and exposure to various programming languages. A firm knowledge of industry best practices and emerging trends in software development is essential. These software developer skills can be found frequently in job listings, on resumes, and in cover letters. The list of skills required for each of the jobs varies widely. According to the Bureau of Labor Statistics, the median annual wage for software developers, applications, was $101,790 as of May 2017. The lowest 10 percent earned less than $59,870, and the highest 10 percent earned more than $160,100. The median for software developers, systems software, was $107,600 in May 2017. The lowest 10 percent earned under $65,670 and the highest 10 percent earned more than $164,150. According to the Bureau of Labor Statistics, employment of software developers is projected to grow 24 percent from 2016 to 2026, much faster than the 7 percent average for all occupations. But jobs for software applications developers are expected to grow even faster, at 31 percent in the same period. Employment of systems developers is projected to grow 11 percent. What Are Duties, Payments, and Outlook for the Construction Laborer?